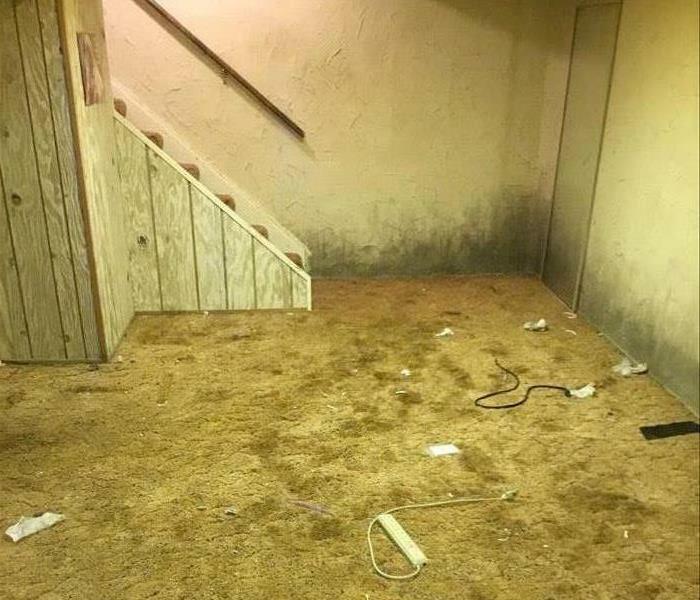 This basement needed some work. Prior to starting the remediation process, we needed to remove the carpet. Following the carpet, we started to remediate the mold that was on the floor and a quarter of the way up the wall around the entire basement. Once the remediation process was complete, we set up and air mover. 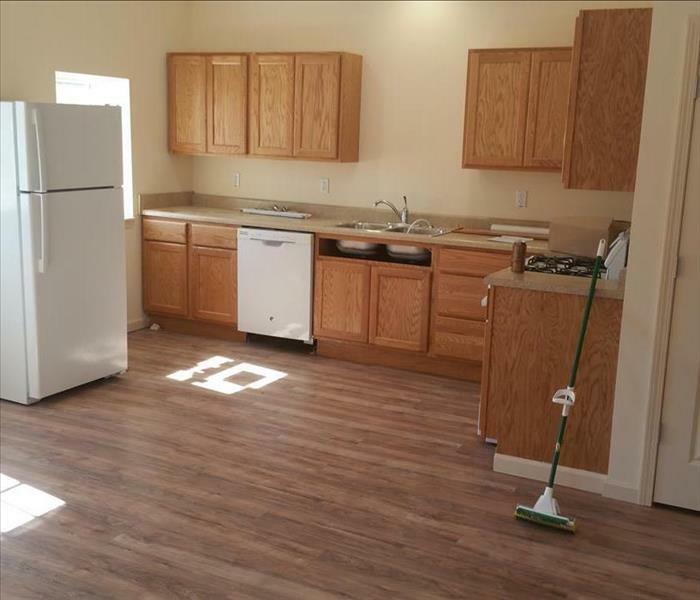 Once the job was complete, we conversed with the customer to ensure that everything was completed to their expectations and left a happy customer in their mold free home! In this attic is 1,983 square feet, the ceiling was completely covered in mold. It was identified and a ventilation issue. The problem was unable to be solved until the mold was taken care of. As a result, Austin and Josh were sent to the site to set-up the containment zone and start the remediation process. During the final walk through with the customer, the attic is clear of any mold and ready for the proper ventilation to be installed. 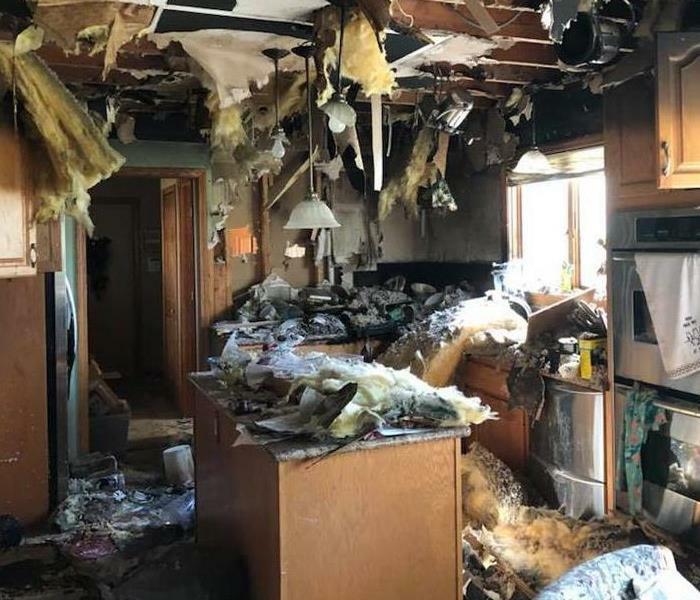 The homeowner was making a baked potato in her microwave. She started it and walked away to do something else. She was brought back into the kitchen, not by the ending beep, but by flames. The potato was wrapped in aluminum foil and cause a fire to engulf her kitchen with flames. After the fire department arrive and put the fire out, we were able to examine the extent of the damage. As you can see in the picture, the ceiling and the back wall was almost completely removed, and the cabinetry is blackened at the top. What is difficult to see in this picture is the damage in to the bathroom behind the far wall. We can see that there are two holes, but there was a mirror on the other side, which is now shattered on the floor. Ben and Austin arrived on site to find a tarp covering the mold discovered in the corner of the dinning room. Prior to removing it, they built a barrier around the effect area. Using the proper protection, they removed the tarp and started to cut the drywall in the effected area. Following proper procedure, they removed up to two feet of drywall around the source to check for any further mold. Confirming that the mold was just located in the corner, they started the mediation and the remediation process. 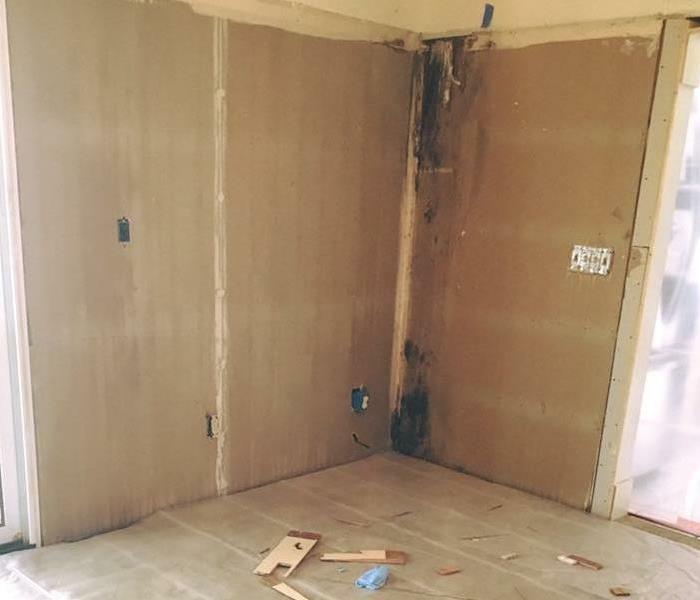 After removing several trash bags of drywall from the space, Austin and Ben started to clean up and touch base with the customer, informing them that the mold had removed and their home is mold free. 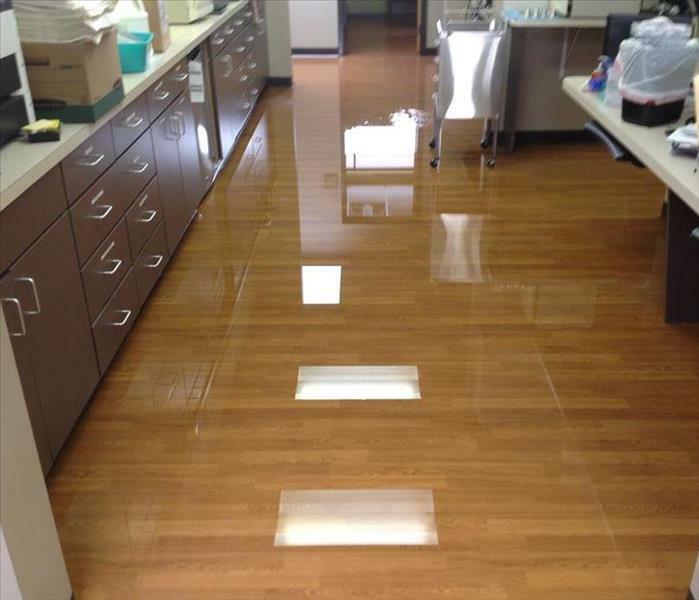 A company in Goodrich experienced sump pump failure that resulted in office flooding. The carpets, as you can see in the picture, were damaged. When demoing the building, the carpet was removed and air movers and dehumidifiers were placed to start the drying process. This company is well on their way to their building being back to normal! 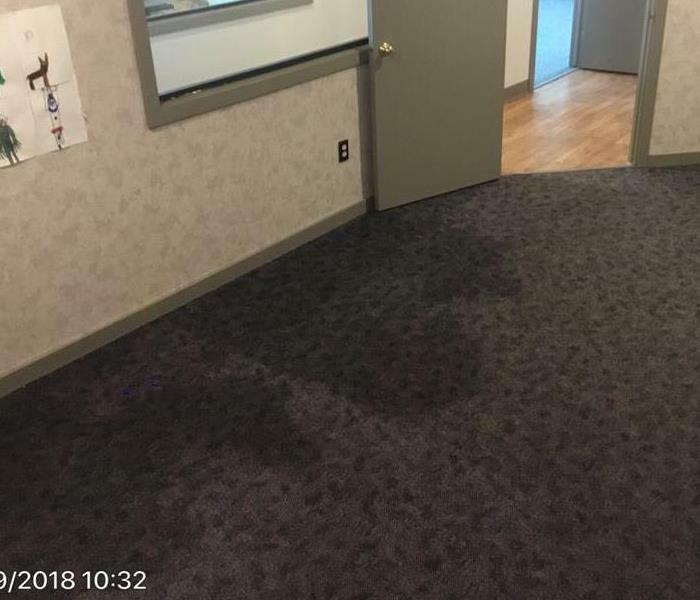 A company in Goodrich experienced a power outage, which lead to sump pump failure and flooding throughout their building. This room in the picture had been cleaned 3-4 times prior to us receiving the call and arriving on site. the source has been fixed and we were able to extract the water. They have not had to clean water up since. During the recent ice storm, a local church's roof leaked and caused water damage throughout the building. This is one of the effected hallways where we placed air movers and dehumidifiers to dry out the carpet. 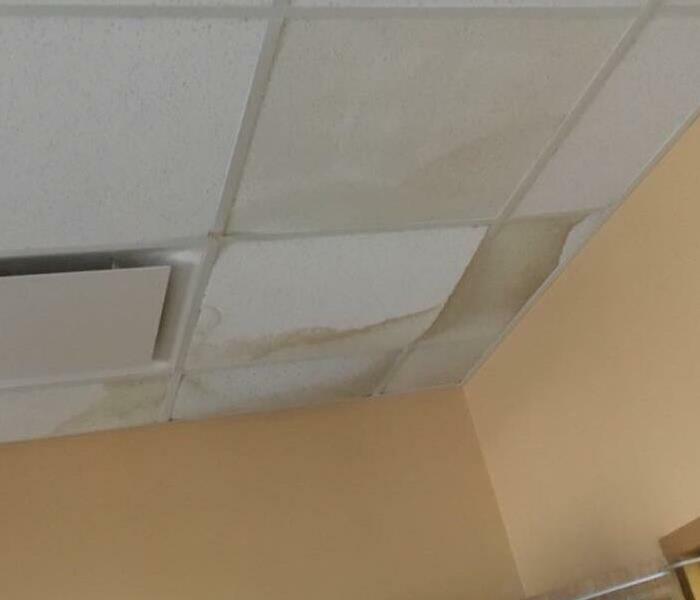 During a recent ice storm, the roof at a local church started to leak, causing water damage in several rooms. This portion of the ceiling, was the most effected and needed to be removed immediately. After a fire in the kitchen apartment above the Doll Museum broke loose, our technicians arrived to a complete disaster last May of 2015. They completely transformed the apartment as well as the museum underneath and left it looking better than ever. SERVPRO of Lapeer team was invited to clean up after a major fire nearly consumed the bus garage of Imlay City schools. The team ended up nearly rebuilding the garage from scratch. the work was completed on time and on budget. 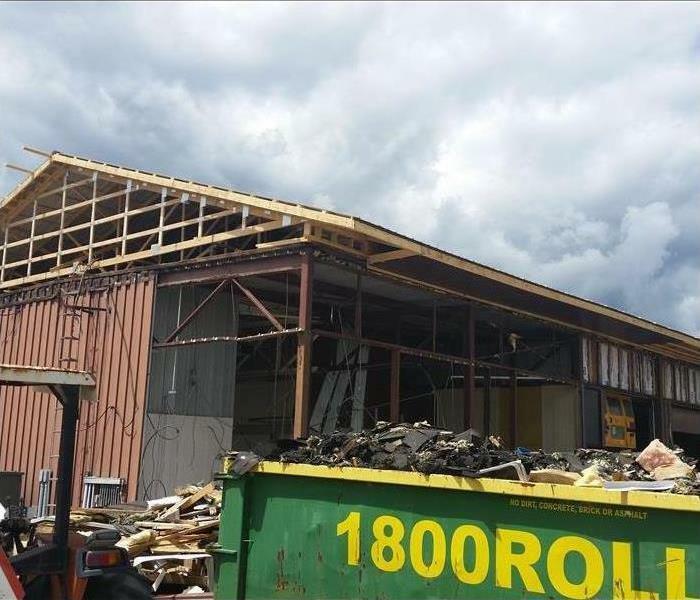 In May 2015, an electrical panel caught on fire burning through the roof of the building. The Imlay City Fire Department was able to put out the fire, and we received a call to come help with the restoration. The next day, we were able to get 100 people to come to the bus garage which allowed us to clean 22 buses in a single day so that Imlay City students were only out of school for 1 day as a result of the fire. We then ordered storage pods, and our pack out girls started packing out items from the office and the garage into them. 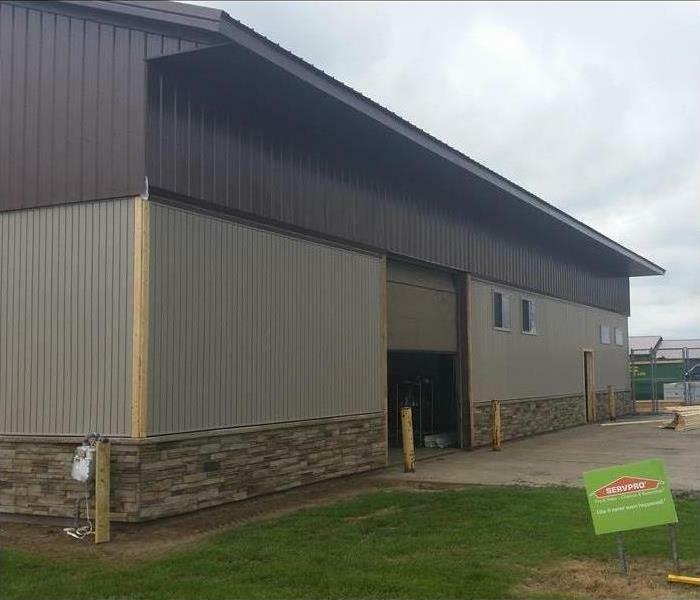 We used scissor lifts to clean the undamaged walls of the garage, and once all the cleaning was done, the repair and reconstruction of the Imlay City Bus Garage began. 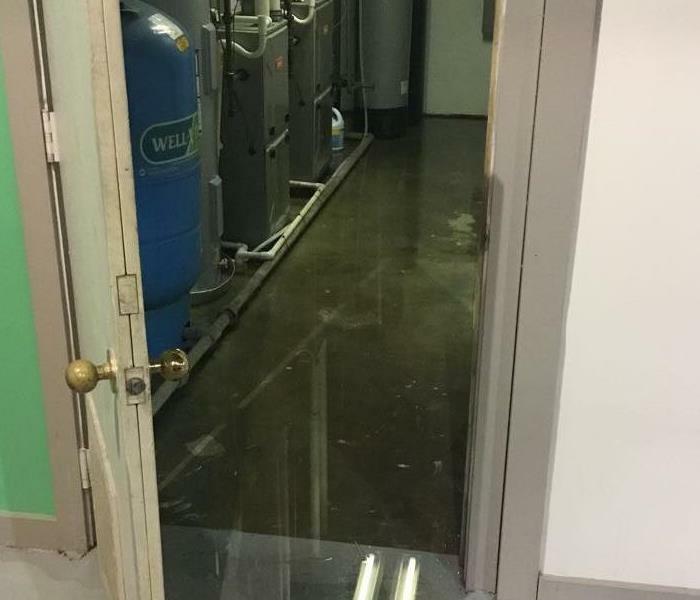 A sudden flood of water inside the Lapeer Medical Center gave cause for an emergency Sunday clean-up by SERVPRO of Lapeer & Grand Blanc. It is important for facilities such as this to call in the pros when unclean water becomes an issue as we are able to extract the water and apply anti-microbial agents to the affected areas in order to kill microorganisms and inhibit potential growth from occurring. Additionally, medical facilities suffer greatly if they are forced to be closed, as do their clients. It was of utmost importance that we get this building dried up and back open as quickly as possible. The Injectidry Floor Drying System can save wet floor and completely dry it out about 90% of the time with little to no damage when completely dry in 3-5 days time. 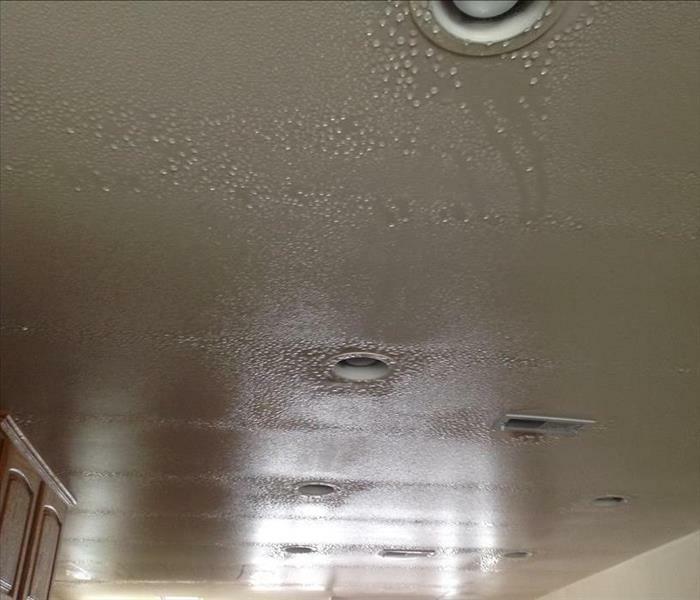 This homeowner had an issue with condensation inside her home on both ceilings and walls from an unknown source. There was no obvious answer as to where the water was coming from upon initial inspection. After thorough review, it was determined that her furnace had malfunctioned as it was not removing the humidity from the air as it was designed to. One of our larger, repeat clients suffered from a failure in their fire suppression system. 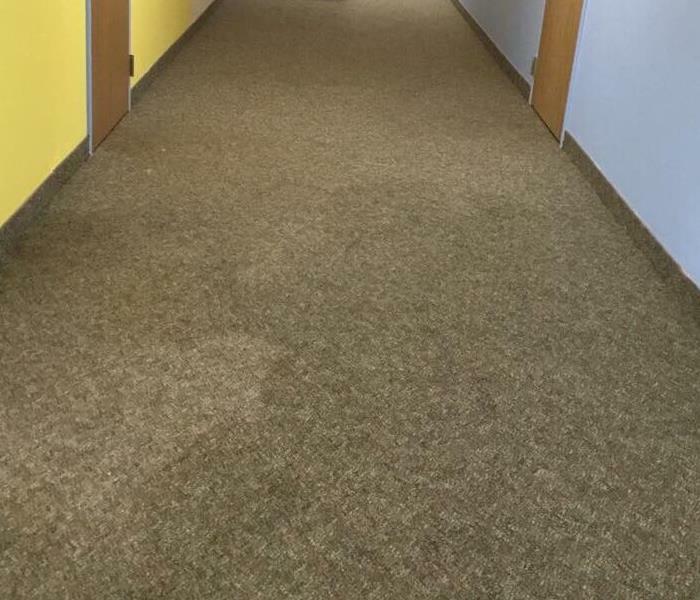 This caused a tremendous amount of damage throughout the facility, forcing us to dry down and mitigate their main lobby, eating area, halls and many of their rooms. This home suffered a second floor pipe failure in the middle of winter while the homeowner's were in Florida. Water continued to poor through the entire home for week(s) until it finally hit the electrical panel; tripping the power to the well pump. This photo shows some of the ice formations on the exterior of the home from water seeping through the walls. This is a home we are currently mitigating in Grand Blanc. The homeowners are snowbirds and have been in Florida. A second floor pipe failed, flooding the home until it finally knocked the power; disabling the well pump. 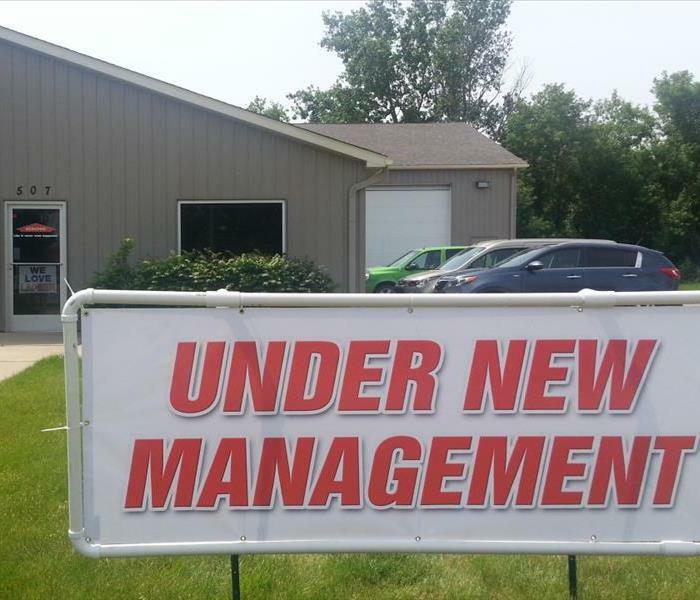 SERVPRO of Grand Blanc has a new owner. Our open house is on 6/25/2015 from 3-7pm. Everyone is invited. 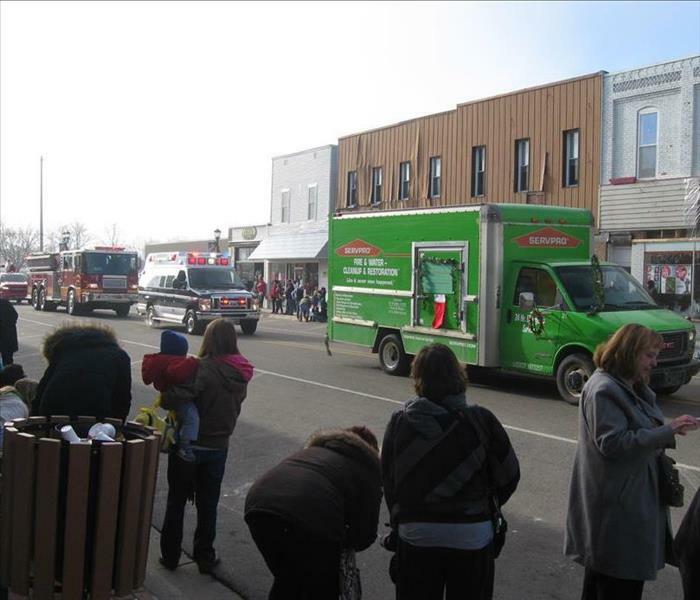 SERVPRO of Grand Blanc takes great pride in being a part of the Lapeer community. We understand that communities like ours hold America together. We want to do our part to ensure the Lapeer community thrives by helping those less fortunate, keeping the area safe and making our community the best it can be.